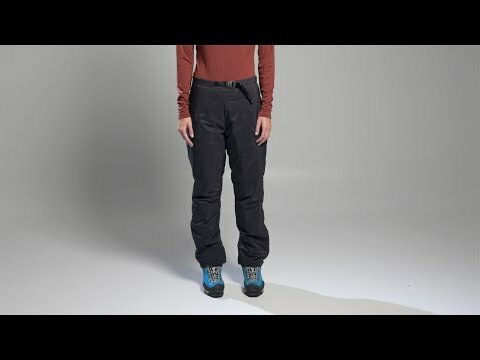 These insulated pants will take you through a full range of winter activities, keeping you warm yet mobile. Stretch inner thread construction keeps insulation close to your body for optimal warmth. The articulated knees and gusseted crotch mean there's no extra fabric to get in your way or slow you down. Ripstop nylon is waterproof enough to sit in a snow cave and breathable enough to be worn all day. A roomy cut and unisex sizing makes these pants a great choice for winter adventurers of all genders. Seams are not taped, so this garment will not be fully waterproof in heavy rain. Fully insulated with 100g weight synthetic insulation. Elastic waist with integrated webbing belt is easy to layer over other pants. Fully separating side zips for easy on/off. Articulated knees and gusseted crotch allow full range of motion. Hems have gripper elastic and boot hooks to seal out snow.